I don't know why I am so surprised by my reaction to the FX series Taboo, it happens all the time with movies. Great performances, expertly crafted mise-en-scène and yet I am left cold by the overall narrative despite appreciating the big picture. 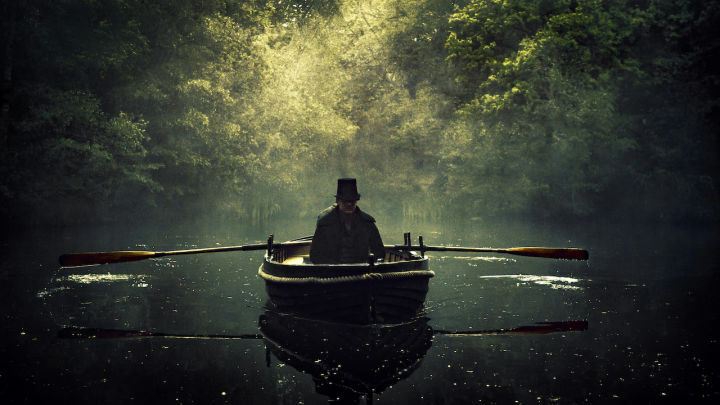 It's all there in Taboo and yet there I am, off somewhere else mentally during heavy dialogue driven sequences because whether it is the fault of the screenplay or not I am not sure, but I'm just not invested into what they are saying like I should be. The fifth episode is another solid, well made installment into the series with some gripping, riveting scenes surrounded by others that did so little for me, and it's a shame. I'm sure many others probably love Taboo, and I wish I did too. This episode begins with the duel that was promised at the end of the fourth episode, and that was admittedly a terrific cliffhanger ending to excite me for what was to come here. Granted, it is pretty safe to say that I knew Tom Hardy wasn't going to die and I don't think that is much of a spoiler to reveal that he didn't, given that it was only the halfway point of the season and he is not only the star of Taboo, he basically is the show despite some really good, important supporting work alongside him. The scene of the duel didn't disappoint, and you could see the pieces fall into place when it is announced that they would go until first blood, not death, with no second shots allowed by either party, yet what happens here does end up being a surprise that I shall not ruin if you are behind on the series. Delaney (Hardy) continues moving forward with his plot to bring down the East India Company and I continue to hope for a truly memorable episode out of the last three left to go, especially considering those may be the actual completion of the entire story, seeing as how Taboo is labeled as a "limited series" and I am not aware of any announcements of a second season. Regardless of my disconnect with it, I will obviously see Taboo through to the end and hope for the best.